St. Augustine (Stenotaphrum secundatum) is a variety of warm-season grass with various cultivars widely used in warm, frost-free and coastal areas of the United States. Some cultivars such as Raleigh perform well in cooler areas experiencing frosts. Its ability to fill in thickly, choke out weeds, quick growth and tolerance to a wide range of soil types and salt, make it a popular choice with gardeners throughout the region. Its susceptibility to pests and disease, however, does make it high-maintenance. Floratam is the most widely used of all the St. Augustine cultivars. Its leaf blades are dark green and coarsely textured and gardeners should mow at a height of 3-and-1/2 to 4 inches in height. Compared to other St. Augustine cultivars, Floratam has a low shade and cold tolerance. It prefers and grows best in warm, sunny conditions receiving approximately six hours of sunshine day. In areas prone to annual frosts, the grass will remain dormant longer, which slows the spring greening process. Herbicides containing atrazine will harm Floratam when applied in temperatures above 85 degrees Fahrenheit, according to the University of Florida. Major pests and diseases are chinch bugs and gray leaf spot. Gardeners who want a dwarf cultivar of St. Augustine that requires less mowing should use Amerishade in their landscapes. It has a slow-growing, upright habit with deep-green leaf blades. It requires mowing to a height of 1-and-1/2 to 2 inches for best performance and looks. The grass requires mowing approximately every two weeks. It tolerates both shady and sunny conditions and performs best in frost-free areas, as it has a low tolerance to cold. Its slow growth makes it difficult to recover from winterkill compared to other cultivars of St. Augustine. 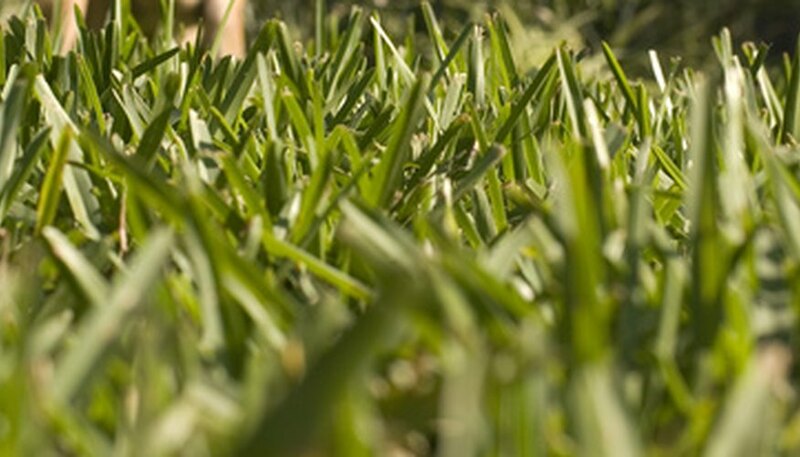 Like other cultivars of the grass, Amerishade is susceptible to pests, diseases and thatch. Gardeners living in cooler areas experiencing annual frosts and freezes should try Raleigh, as it is more cold-tolerant than other cultivars of St. Augustine grass. It grows best in heavier soils such as clay or organic with a low pH. Its leaf blades are medium green and have a coarse texture. Raleigh requires mowing to a height of 3 to 4 inches. During hot summer temperatures, the grass has a tendency to yellow and slow in its growth rate, as it prefers cooler temperatures. The grass is susceptible to chinch bugs and brown patch and may require applications of iron during its yellowing stage.